After watching USA's 5-3 victory over what was clearly a far superior Canadian team in the Olympics a few weeks ago, the one thing that really struck me--besides Martin Brodeur's atrocious goaltending--was that the Canadian team lost the same way that Mike Babcock teams always lose: dominate the stat sheet in almost all meaningful categories but get beaten in the one that counts. It stuck with me to the point that, when the US tied the gold medal game to send it into overtime, I tweeted, "USA has to win. As a Red Wings fan, I've seen too many Mike Babcock teams in overtime." One of the key tenants of Babcock's strategy--and seemingly Red Berenson's, one of the main reasons I'm writing this here--is simply to get pucks on net. Much of the offense works from the defense, down, with players screening the front of the net and looking for rebounds. (Note that what follows is not necessarily a condemnation of this system, but a few musings on its practicality in Hockey 2010.) 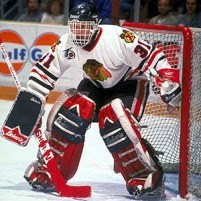 The problem is, while this was an adequate strategy 15 years ago, the evolution of goaltending, and more specifically, goaltending equipment may be making this system mostly obsolete--during even strength play, about more which later. The pictures above are of Dominik Hasek circa 1992 and US Olympic darling Ryan Miller, respectively. In recent years, the NHL has made a move to try and limit the size of goalies' pads, primarily, the size of the blocker, catcher, and leg pads (specifically how wide they are, as well as how high they extend beyond the knees). Aside from being physically larger (Miller is about three or four inches taller than Hasek), you can plainly see that the padding each uses is drastically different in size. The point of Babcock and Berenson's systems is to get pucks on net with screens set up in front of the goalie, and look for tips and rebounds. This works well when a goalie is scrambling to try and find the puck and get in front of it. Rebounds are hard to control and often, you'd see a puck just slide into the net untouched because the goalie was unable to find it at all. But with today's goalie technology and the extensive training that goes into teaching goalies the butterfly style (you rarely, if ever, see a goaltender playing anything else), goalies can now basically take up the entire net and not worry about finding the puck, setting up a virtual wall behind the screen. 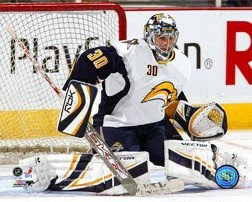 As you can see in the picture above, Miller's extended leg pads cover almost the entire bottom of the net, while also covering his five hole, something older pads were unable to do. What this means is that while shots might get to the net with screens in front of the goalie, there's a bare minimum of space for the puck to actually get past him. And professional and collegiate goalies are so well trained that the few rebounds they do allow, they kick to the corner. Simply put, all of the advantages this system afforded 15 years ago are mostly tossed by the wayside. And yet, this still seems to be the most effective offensive strategy on power plays. Why? One thing you'll probably notice from Red Wings/Michigan games is the influx of block shots by the opposing team. NHL and college players know their positions and for the most part, play them crisply. This means defensive wingers will be near defensemen in the offensive zone at almost all times. And in the Babcock/Berenson systems, you tend to see a lot of defensemen shooting the puck into the shins of the opposing wingers. The few shots that do get through to the net are often cancelled out by 1-on-1 matchups in front of the net, oversized goalies, and hapless rebounds that end up getting swept out of the zone, or at least out of harms way. The point being, with goalie technology and disciplined players, long--even screened--shots from the point are becoming increasingly low quality. This strategy, on the power play, however is completely different. For the sake of argument, we'll say that a team on the penalty kill plays what's known as a the box or diamond, essentially a zone defense in which defenders try to take away passing lanes and attack when the offense looks out of sorts of loses the puck. The first advantage is that, obviously, teams are no longer playing 5 vs. 5, meaning that not only are shots from the point less likely to be blocked, the offensive team is more likely to get favorable numbers in front of the net should a rebound or tip occur. Next, efficient passing bends and breaks the box, further opening up lanes for the offense to shoot through and creating more matchup problems for the defense. With numbers, the system's advantages are restored. So what's the point? The point is that shots on goal is not necessarily an indicator of how well a team has played, especially in this system. Babcock and Berenson have both run into these issues in the last year or so, seeing their teams significantly outshoot their opponents but lose by one or more goals because of the quality of shots. In all honesty, with the way goaltending is trending (not only are the pads getting bigger, but the goalies themselves are getting bigger, faster, and stronger), I'm not sure that this style of play is a sustainable winning offense in the future.